Zygmunt Bauman is one of the world’s leading sociologists. He is particularly interested in how the west’s increasing obsession with ‘individualism’ actually prevents the individual from being free in any meaningful sense of the word. In ‘Liquid Times (2007), Bauman argues that there are a number of negative consequences of globalisation such as the generation of surplus people who have no where to go in a world that is full; of increasingly visible inequalities as the rich and the poor come to live closer together; and of a world in which it is increasingly difficult for communities and nations to provide collective security. According to Bauman, the ultimate cause of negative globalisation is due to the fact that the owners of Capital are invisible and shifting, having the power to invest locally without making commitments, and even to ignore international law if they deem it in their interests. The global elite are globally mobile, they are not stuck in one place, and they are free to move on if there are better investment opportunities elsewhere. The elite are seen as creating an unstable world as they move from place to place, seeking to maximise their profits. Meanwhile, the experience of ‘negative globabalisation’ for the rest of us who are ‘doomed to be local’ is one of increasing anxiety, fear, and suspicion, which derive from living in an unstable and unpredictable world over which we have no control, and we are compelled to develop strategies to counter the unstable, unjust, unequal and ‘risky’ and ‘dangerous’ world that the forever shifting elite leave in their wake. The strategies adopted depend on the specific experience of negative globalisation, but they nearly always involve putting up barriers to protect us from ‘dangerous others’, or they involve escaping from a world that is perceived as no longer worth living in. Those that ‘run away’ include everyone from refugees fleeing a war torn country to the millions of people in the West who continually reinvent themselves selves through seeking out new life experiences rather than rooting their identities in involvement in local and national institutions. ‘Barrier strategies’ include the emergence of fortress Europe to keep refugees out; the development of gated communities and the move towards zero tolerance policing policies in many cities. For Bauman, these strategies are always ineffective, because they do no address the root cause of our anxiety, which is the fact that our national and local institutions can no longer provide us with security in the wake of instabilities brought on by advanced global capitalism. Instead, these strategies end up increasing the amount of anxiety and fear and segregation and eventually serve to justify our paranoia. The remainder of this article looks at three elements of ‘negative globalisation’: The generation of surplus people; Increasingly visible inequalities; and the undermining of national and local institutions. Bauman argues that ‘When the elite purse their goals, the poor pay the price’, seeing the instabilities and inequalities caused by global capitalism as creating the conditions that can lead to ethnic nationalisms, religious fanaticisms, increased civil wars, violence, organised crime and terrorism, all of which do not respect national boundaries. As a result, there is a new ‘global frontier land’ occupied by refugees, guerrilla armies, bandit gangs and drug traffickers. Focussing on refuges, Bauman points out that they are outside law altogether because they have no state of their own, but neither are they part of the state to which they have fled. He points out that many Palestinians, for example, have lived in ‘temporary’ refugee camps for more than a decade, but these camps have no formal existence and don’t even appear on any maps of the regions in which they are situated. To make matters worse, refugees often have no idea of when their refugee status will end, and hence Bauman argues that they exist in a ‘permanent temporary state’ which he calls the ‘nowhere land of non humanity’. Refugees in camps can be forgotten, whereas if they were amongst us, we would have to take notice of them. In these camps, they come to be seen as one homogenous mass, the nuances between the thousands of individuals living therein becoming irrelevant to the outsider. Refugees, in fact, go through a process much like Goffman’s mortification of the self, as many of them are stripped of all the usual things they need to construct an identity such as a homeland, possessions and a daily routine. Unlike the mentally ill who Goffman studied, however, refugees have no formal rights, because their self- mortification takes place in a land that doesn’t formerly exist. Bauman’s point is that one of the worst consequences of globalisation is the absolute denial of human self expression as experienced by refugees. While Bauman’s work provides us with an insight into why refugees may want to escape their permanent temporary camps, there is little chance of this happening. For a start, Europe is increasingly developing a ‘fortress mentality’ in which we try our best to keep refugees out the European Union through offering aid to countries that boarder international crisis zones in order to help them, rather than us having to deal with the ‘refugee problem’ ourselves. Those refugees that do make it to the United Kingdom and other European countries have an ever slimmer chance of being awarded Asylum, and are increasingly likely to be locked up in detention centres. In the United Kingdom, Asylum seekers are not allowed to work or to claim benefits, which in turn makes it incredibly difficult for such individuals to ever integrate into what is to them a new and strange country. Thus even for those who escape, their reward is further experience of marginalisation. Bauman also deals with why the general populace of the West are so scared of Refugees. Firstly, and very importantly, he reminds us that the real underlying cause of our fears, anxieties and suspicions is that we have lost control over the collective, social dimensions of our life. Our communities, our work places, even our governments, are in constant flux, and this condition creates uncertainty about who we are and where we are going, which is experienced at the level of the individual as fear and anxiety. This experience of fear and anxiety means that we are unnaturally afraid of a whole range of things, but a further reason that we might be especially scared of Asylum seekers in particular is that they have the stench of war on them, and they unconsciously remind us of global instabilities that most of us would rather forget about. Asylum seekers remind us, ultimately, that the world is an unjust place full of tens of millions of people who, through no fault of their own, bear the consequences of negative globalisation. Asylum seekers remind us of the frailties of a global system that we don’t control and don’t understand. Rather than looking at the complex underlying causes of our irrational sense of fear, the Media and Politicians see people such as Asylum seekers as an easy target: They are confined to camps, and hence stuck in one place, and they will obviously look different and hence are more visible. Keeping Asylum seekers out, or sending them back in droves, becomes a political tool, with politicians winning points for adopting ever greater levels of intolerance towards the desperate. The consequence of this for refugees is bleak. A major theme of Bauman’s work is that once fear of a group in society has been generated it is self perpetuating, whether or not that fear is justified. The very fact that we are afraid of Asylum seekers means we are less likely to approach them, it means that were are less likely to give them a chance, which in turn leads to a situation of mutual suspicion in which both parties seek to keep as much distance between themselves as possible. The radical inequality between citizens in the United Kingdom and refugees living in the no where land of non humanity is stark, but, for most of us, easily ignored. Much more visible are the inequalities that exist within International cities such as London, New York, and, even more obviously Mexico City and Rio Di Janeiro. Bauman points out that cities used to be built to keep people out, but today they have become unsafe places, where strangers are an ever looming presence. The underlying reason why the modern city is a place that breeds fear and suspicion is because they are sites of some of the most profound and visible inequalities on earth, where the poor and rich live side by side. As a result, those who can afford it take advantage of a number of security mechanisms, such as living in gated communities, installing surveillance cameras, or hiring private security. The architecture of the modern city has become one of segregating the haves from the have nots. For the poor, this ‘fortification mentality’ is experienced as ‘keeping us excluded from what we can never have’ and they effectively become ghettoised in areas which will always seam undesirable compared to the places they are prevented from being. Thus the poor are permanent exiles from much of their city. Lacking economic capital, sub cultural capital becomes the only thing the excluded can draw on in order to carve out some status for themselves. This, argues Bauman, is the reason why there are so many distinct and segregated ethnic identities. These are the strategies adopted by the poor to carve out some freedom for themselves, the strategies of those who are doomed to be local. This strategy, however, breeds a culture of difference, and separatism. It breeds a city in which we are surrounded by strange others whose territory will always seam unfamiliar, which in turn breeds yet more suspicion, fear and insecurity. Islands of difference rather than an integrated city are the result, a city populated by unfamiliar people who we do not know. Bauman points out that, once visited on the world, fear takes little to keep it going. Social life changes when people live behind walls, wear handguns, carry mace and hire security guards. The very presence of these things makes us think the world is more dangerous, leading to increased fear and anxiety. It doesn’t actually matter if the ‘others’ are actually, or ever were, dangerous, the fact that we put up defences against them is proof enough of the fact that they must be a threat. While Globalisation creates instabilities which creates surplus people and stark inequalities, Bauman also argues that Globalisation erodes the ability of the state and local communities to provide genuine stability and security for individuals. Social institutions such as the family, education and work dissipate faster than the span of one’s life, and it becomes difficult for individuals to construct a coherent life-project. This situation results in what Bauman calls ‘existential tremors,’ where individuals do not have a stable sense of who they are, or what they belong to, resulting, as we have already come across, in increased feelings of anxiety, fear and uncertainty. As evidence of this, Bauman points out that most of us do not generally perceive the future as a bright place of hope and of ‘better things to come’, instead we see the future as a series of challenges to be overcome, of risks to be managed, and of threats to our security. In short, the future is a bleak, dark, and uncertain place. In the absence of collective security, individuals and families are left to try and develop strategies to find security and stability themselves, and our goals become limited to the managing risks, and our horizons limited to the every narrowing sphere over which we still have some measure of control! Thus we invest in pensions, become very protective of our children, and become increasingly suspicious of strangers. We are obliged to spend our time doing things to minimise the perceived threats to our safety: checking for cancers, investing in home security, and monitoring our children. Our life-project becomes not one of developing ourselves, not one of striving for a deeper understanding of what it means to be human, but, instead, our life goals become limited to avoiding bad things happening to ourselves. Bauman also has a pessimistic take on the common practice of the continual reinvention of the self. Bauman argues that the process of constructing an identity is sold to us as something that is fun, as something that should be pleasurable, and as something that is indicative of individual freedom. One only needs look at the various networking and profiling sites to see that the expression of self identity is something associated with pleasure and leisure. It has become a normal part of daily life to spend a considerable amount of time, effort, and money on constructing, maintaining and continually transforming one’s self. Bauman, however, reminds us that although we may think we are free, we are actually obliged to engage in this process of continual reinvention because our social lives are in continual flux. Furthermore, many identities are not rooted in the local, the social or the political, they are much more floating and transient, based on fashion, music, and interests, and Bauman interprets many of these strategies as an attempt by individuals to try and escape from a world over which they have no control. Following Joseph Brodsky, Bauman is rather scathing of the range of shallow strategies many of us adopt to escape from the world, and ultimately argues that they are all pointless…. Bauman seams to be arguing that individuals will never find peace of mind, never find ‘who they really are’ unless they have stability and security, and in order to have that, people need to root themselves in local and national institutions, otherwise, our attempts to find ourselves through the reinvention of the self will always be less than satisfactory. 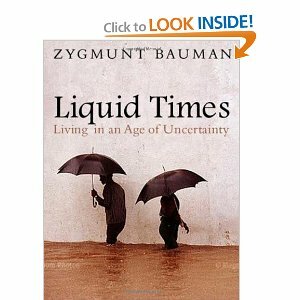 Bauman’s work is important as it reminds us that there is inequality in the way we experience risk and instability. On the one hand, the global elites who cause our global society to be unstable benefit from this instability and are able to avoid the worst effects of it, through, for example, moving away from war zones, or retreating into gated communities. Meanwhile, the poorest are the ones who suffer, having lost, in the extreme example of refugees, the very right to be regarded as human beings. As a final perverse twist, the elites that created this situation in the first place end up either retreating to expensive enclaves that are well secured, or they profit from our fears politically and financially. One cannot help but feel incredibly pessimistic after reading Bauman’s work. It is as if hegemonic control has penetrated so far into the hearts and minds of the populace that the huge effort required for people to reassert localised, communitarian politics against global capitalist hegemonic power is simply too much to ever hope for. But for those that are inclined to join Social Movements, at least Bauman’s work identifies an elite to position oneself against, and reminds us this elite continually flout the principles of genuine freedom, equality, in the pursuit of their self interest. Bauman’s work also offers a useful counterpoint against what some would regard as the pointless relativism of post-modernism and the mediocre third way quiescence of Anthony Giddens. Next post: Is it worth doing a degree?